Who couldn't love the adorable face of an owl? 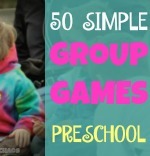 Children, especially preschoolers, love owls! These 6 Owl projects are perfect for preschoolers and anyone who loves owl country crafts. Grab your family and get crafting. Enjoy! Walnut shells are so visually inspiring. They beg you to pick them up and craft with them. 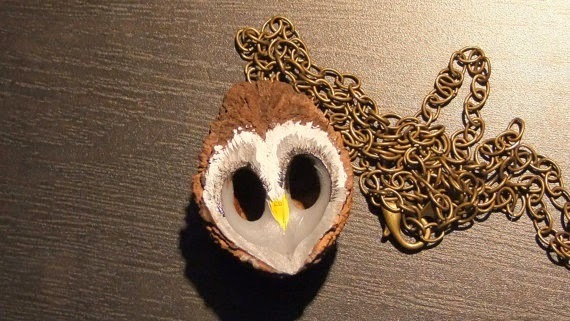 You could easily make your own owl walnut necklace like this one we found on etsy. Inspiration for our Walnut Owl Crafts. We found this on Etsy.com. 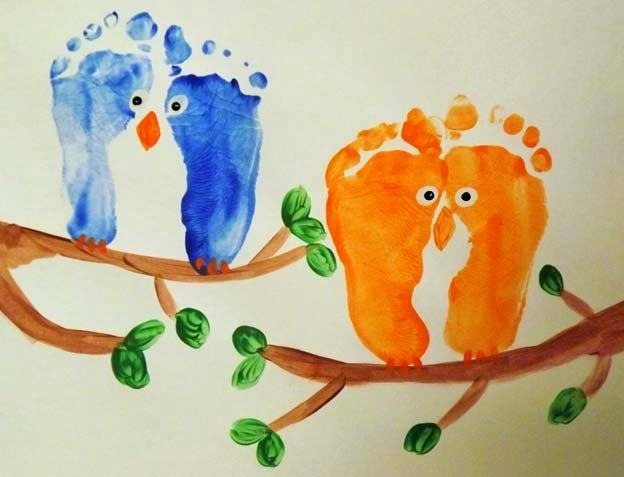 Make Owl Footprint Art like these tiny feet found at Tinytotties.com This is a fun way to find out if your kids have sensory issues. Is the cold, gooey paint fun to step in or scary? Owl footprint art for kids. We made this cool, torn Construction Paper Owl Art Project for Preschoolers at one of our preschool classes. Click the link to watch a video tutorial. Crafting with cupcake liners is the new rage. Owl Craft Cupcake Liners are everywhere. 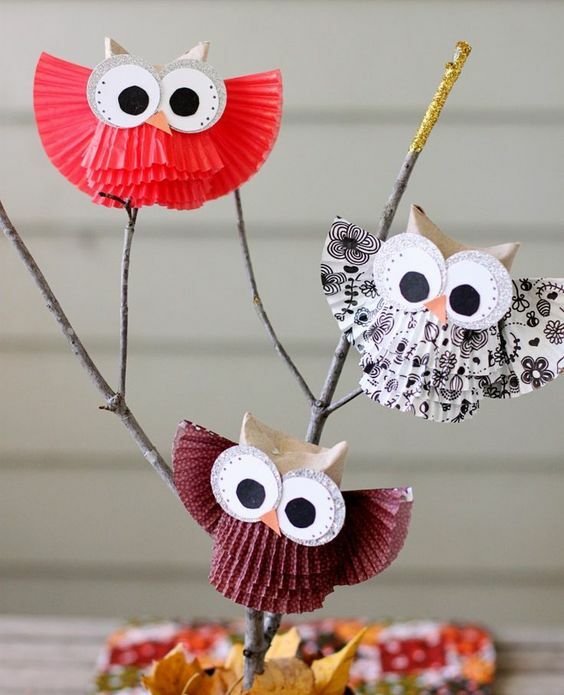 So, grab those leftover cupcake liners and make a cute little owl. Maybe you're more into owl country crafts. If so, you will love this fall Owl Country Crafts Door Wreath. Looking for an easy owl craft for children? 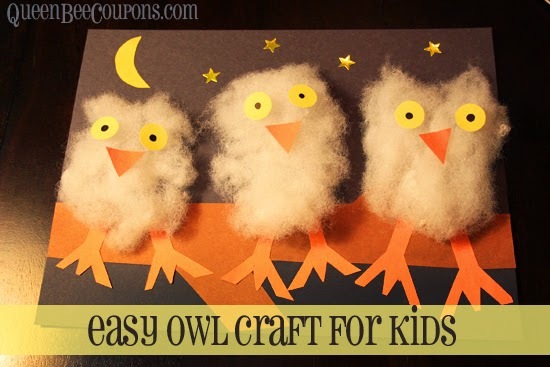 This owl craft for kids is perfectly fun! You only need 3 things to make this cute owl paper craft: construction paper, cotton, and glue! Find the details to make a owl at Queen Bee Coupons. Owl craft for preschooler kids. *We also use affiliate links, if you make a purchase we get a tiny commission. 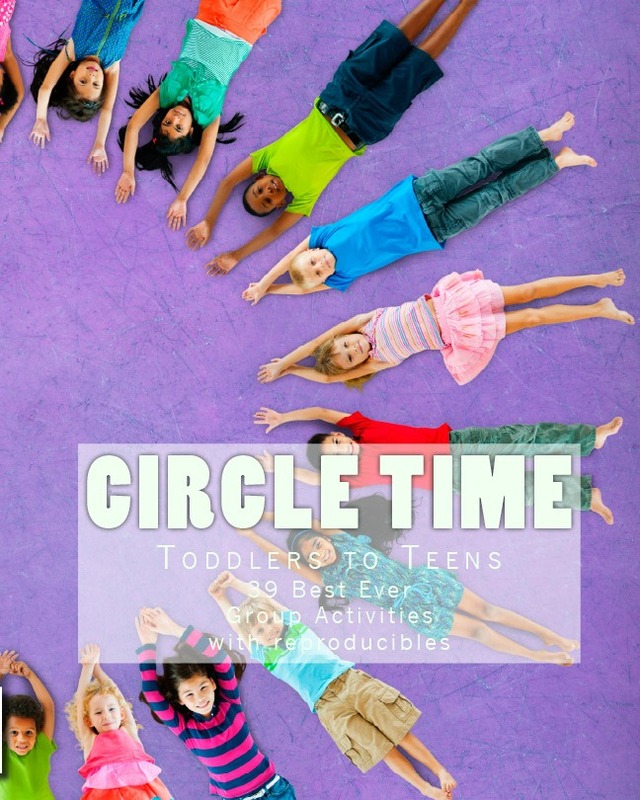 Kids Creative Chaos participates in the Amazon LLC Associates Program*, an affiliate advertising program designed to provide a mean for blogs to earn advertising fees by linking to Amazon properties, including, but not limited to, amazon.com, endless.com, myhabit.com, smallparts.com, or amazonwireless.com. We also offer Tapinfluence, Google Adsense, SoFab, and Izea ads here. 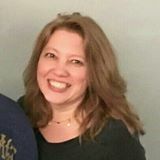 Thanks so much for helping us keep the lights on!